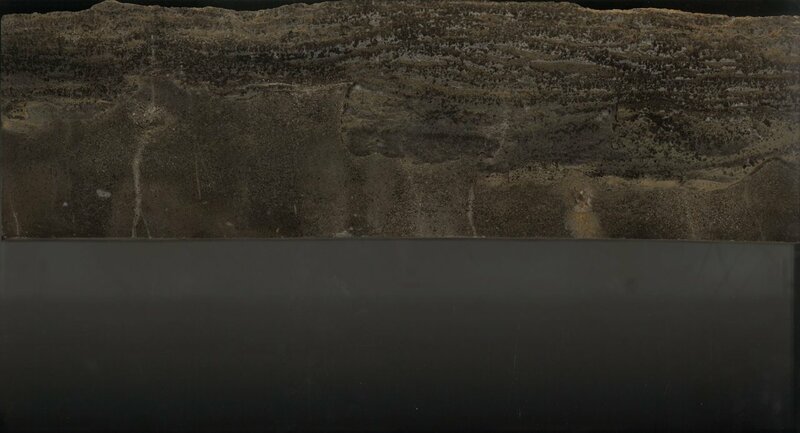 The largest extinction in Earth's history marked the end of the Permian period, some 252 million years ago. Long before dinosaurs, our planet was populated with plants and animals that were mostly obliterated after a series of massive volcanic eruptions in Siberia. Fossils in ancient seafloor rocks display a thriving and diverse marine ecosystem, then a swath of corpses. Some 96 percent of marine species were wiped out during the "Great Dying," followed by millions of years when life had to multiply and diversify once more. "This is the first time that we have made a mechanistic prediction about what caused the extinction that can be directly tested with the fossil record, which then allows us to make predictions about the causes of extinction in the future," said first author Justin Penn, a UW doctoral student in oceanography. 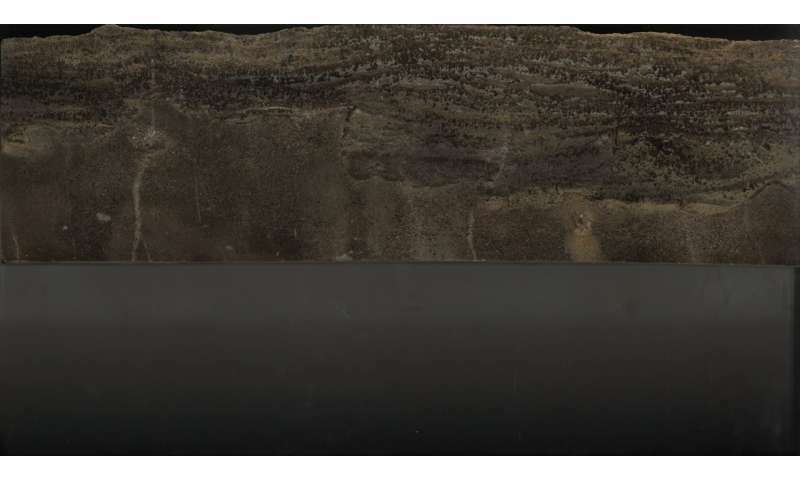 Researchers ran a climate model with Earth's configuration during the Permian, when the land masses were combined in the supercontinent of Pangaea. Before ongoing volcanic eruptions in Siberia created a greenhouse-gas planet, oceans had temperatures and oxygen levels similar to today's. The researchers then raised greenhouse gases in the model to the level required to make tropical ocean temperatures at the surface some 10 degrees Celsius (20 degrees Fahrenheit) higher, matching conditions at that time. The model reproduces the resulting dramatic changes in the oceans. Oceans lost about 80 percent of their oxygen. About half the oceans' seafloor, mostly at deeper depths, became completely oxygen-free. To analyze the effects on marine species, the researchers considered the varying oxygen and temperature sensitivities of 61 modern marine species—including crustaceans, fish, shellfish, corals and sharks—using published lab measurements. 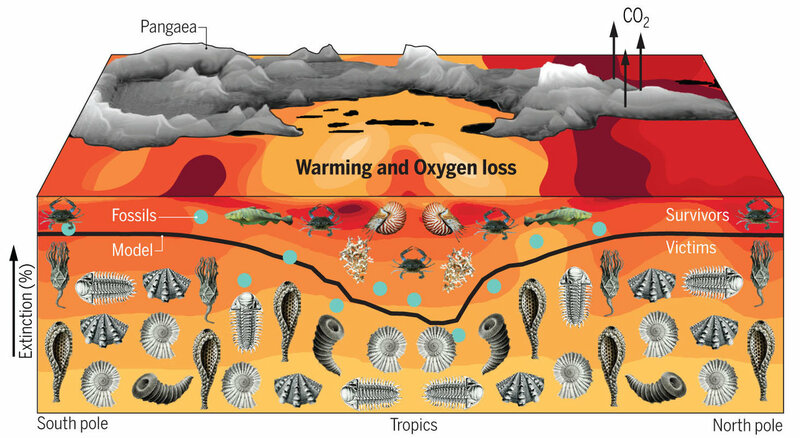 The tolerance of modern animals to high temperature and low oxygen is expected to be similar to Permian animals because they had evolved under similar environmental conditions. The researchers then combined the species' traits with the paleoclimate simulations to predict the geography of the extinction. "Very few marine organisms stayed in the same habitats they were living in—it was either flee or perish," said second author Curtis Deutsch, a UW associate professor of oceanography. 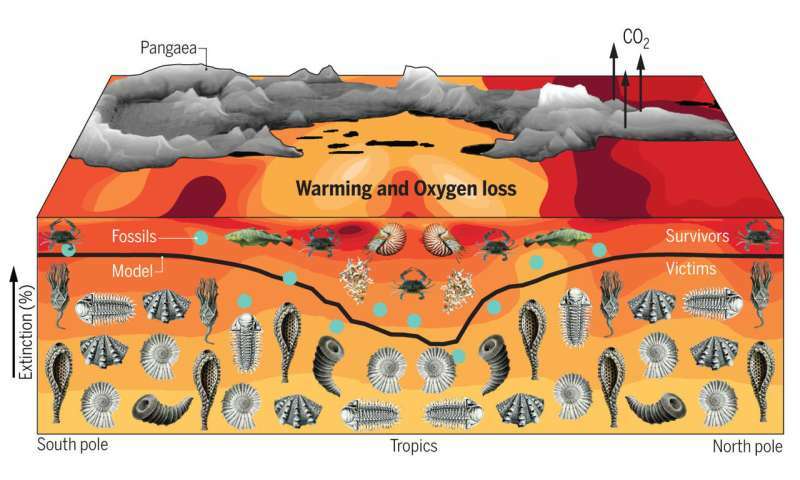 "The signature of that kill mechanism, climate warming and oxygen loss, is this geographic pattern that's predicted by the model and then discovered in the fossils," Penn said. "The agreement between the two indicates this mechanism of climate warming and oxygen loss was a primary cause of the extinction." The study builds on previous work led by Deutsch showing that as oceans warm, marine animals' metabolism speeds up, meaning they require more oxygen, while warmer water holds less. That earlier study shows how warmer oceans push animals away from the tropics. The new study combines the changing ocean conditions with various animals' metabolic needs at different temperatures. Results show that the most severe effects of oxygen deprivation are for species living near the poles. "Since tropical organisms' metabolisms were already adapted to fairly warm, lower-oxygen conditions, they could move away from the tropics and find the same conditions somewhere else," Deutsch said. "But if an organism was adapted for a cold, oxygen-rich environment, then those conditions ceased to exist in the shallow oceans." The so-called "dead zones" that are completely devoid of oxygen were mostly below depths where species were living, and played a smaller role in the survival rates. "At the end of the day, it turned out that the size of the dead zones really doesn't seem to be the key thing for the extinction," Deutsch said. "We often think about anoxia, the complete lack of oxygen, as the condition you need to get widespread uninhabitability. But when you look at the tolerance for low oxygen, most organisms can be excluded from seawater at oxygen levels that aren't anywhere close to anoxic." "Under a business-as-usual emissions scenarios, by 2100 warming in the upper ocean will have approached 20 percent of warming in the late Permian, and by the year 2300 it will reach between 35 and 50 percent," Penn said. "This study highlights the potential for a mass extinction arising from a similar mechanism under anthropogenic climate change."